Top round is a a cut of beef from the upper rear leg of the cow. Top round is a lean, flavorful piece of meat that can be quite tough if prepared incorrectly. London broil is preparation of meat in which the steak is quickly pan fried until it is just medium rare. Making a top round London broil will produce a juicy, tender piece of meat that takes advantage of the cut's flavor while preventing it from becoming tough and chewy. 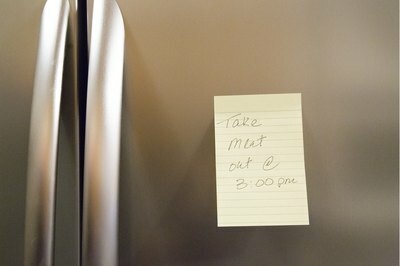 Bring the steak to room temperature by taking it out of the refrigerator two hours before cooking. Rub the steak on all sides with the dry mustard and sprinkle with salt and pepper. Tenderize and even out the thickness of the meat to one inch thick using a meat pounder. 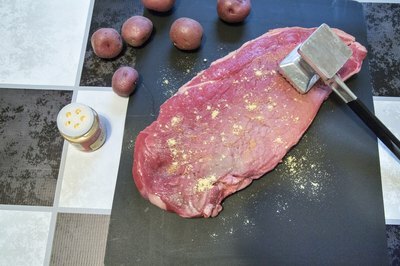 Carefully cut away any connective tissue from the steak. Heat the skillet over medium high heat. Spread the softened butter over each side of the steak then place in the hot pan. Cook the steak for two to three minutes on each side, or until each side is nicely browned. 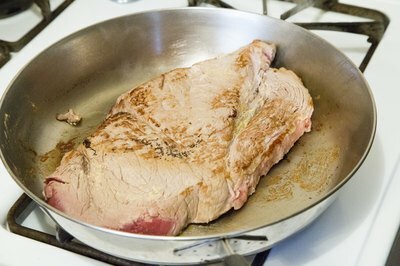 Remove the pan from the heat and allow the steak to rest in the pan for five minutes. If your steak is thicker than one inch, finish cooking it in an oven heated to 325 degrees Fahrenheit for 15 minutes. Allow the steak to sit at room temperature for five minutes before slicing it. 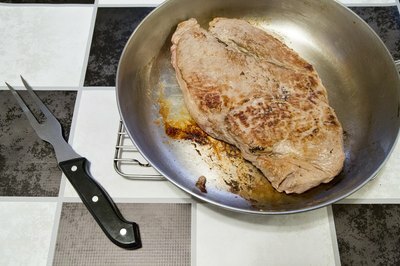 Slice the steak thinly, on a diagonal and against the grain. 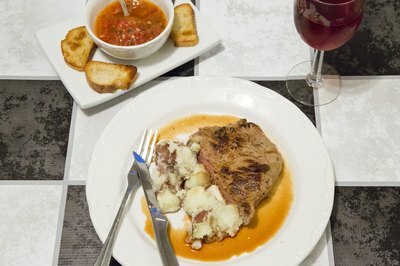 Cook the steak to only medium rare because cooking it any longer will make the meat very tough.